UNT fans will have to wait at least one more year for the Mean Green football team to have its first 2-0 record since 1994. Turnovers were the story of the game as the Mean Green (1-1) lost its first game of the season to the University of Ohio, 27-21. In the first quarter, Ohio took control of the game on the first play of the game. Senior quarterback Tyler Tettleton connected with wide receiver junior Chase Cochran for an 80-yard touchdown to take an immediate 7-0 lead. Due to turnovers, the Mean Green struggled during the first half of the game. An intercepted pass thrown by senior quarterback Derek Thompson was returned for a touchdown by Ohio, giving the Bobcats a 21-7 advantage at halftime. The interception was Thompson’s first of the season. In the first half, the Mean Green offense had seven opportunities to convert a third down and failed on each attempt. 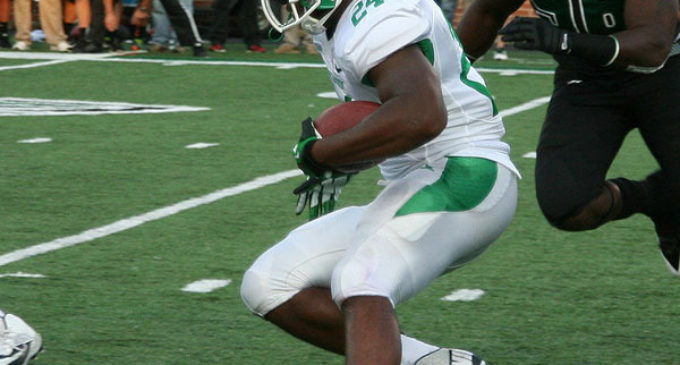 UNT also lost two fumbles during the game. In the second half, UNT’s offense came alive with two touchdown passes from Thompson helped tie up the game with 12:51 left in the final quarter. The Mean Green received a boost from senior receiver Darnell Smith, who finished the game with nine catches for 89 yards and the game-tying touchdown catch. But despite the halftime surge, Ohio was able to outlast the Mean Green with two field goals in the fourth quarter to pick up its first win of the season. The Mean Green will head back home to face Ball State University (2-0) on Sept. 14 at Apogee Stadium. The game kicks off at 3 p.m.